One turn of an easily reached switch - then a flood of steady, penetrating light, illuminating clearly the roadway for ample distance ahead, virtually turning night into day. Add to this the convenience of merely touching a button to operate your warning signal, and you have the advantages of an electrically equipped Indian. Because of its convenience, cleanliness, improved appearance and the added pleasure derived, the electrically equipped Indian Motocycle is in greater demand than ever before. Indian riders have long ago recognized the fact that it is the purpose and desire of the Hendee Manufacturing Company to furnish the best equipment obtainable. After an exhaustive and thorough test covering a period of three years, the Splitdorf Mag-Dynamo has once more been selected by the Hendee Manufacturing Company as the most efficient, easiest operated and simplest electrical equipment they can procure. Many thousands of satisfied users of this Splitdorf product are ardent boosters for this Indian choice. The Splitdorf guarantee is in back of every instrument. Its high efficiency, simplicity of construction and its positive ignition facilities are the cardinal reasons for its adoption by Indian. The Mag- Dynamo is unexcelled for satisfactory service and careful workmanship. The Mag-Dynamo is so built that the battery begins charging when the motor reaches a speed of 10 miles per hour. Automatic brraker contact prevents leakage of current from battery. Lighting current is automatically regulated so that surplus current is turned into magneto circuit, thus making a hotter spark. A quick get-away is facilitated by its ability to generate this hotter spark. The Mag-Dynamo combines in one compact unit true high tension ignition and ample output of current for lighting and charging the battery, experience proving this to be the ideal instrument for existing conditions found in motorcycling. The automatic control of the Mag-Dynamo is a distinctive feature, the function of which is to control the current output at all speeds. This guards the battery from being overcharged at the highest motor speed. Positive control of current output in order that the battery will not be overcharged. No wearing or burning of breaker points or commutator. Full load at moderate speeds. Radial bearings throughout, to assure perfect alignment. No permanent magnets to become demagnetized. Fully enclosed, water and dust-proof. The Mag-Dynamo is of the dual unit type, there being two armatures placed one above the other. The upper one being that of the generator. -The ignition is true high-tension, with or without the battery, making extra circuit breakers or complicated devices unnecessary. The direct current element is entirely self-contained and controlled within the instrument. It automatically connects and delivers to the battery and lamps a suitable voltage and quantity of current for charging, lighting and ignition. The cable fastening in the brush holder has been improved to the extent of threading the end of the brass terminal of the cable to permit it to be screwed into the brush holder, eliminating any tendency of a poor connection at this point. 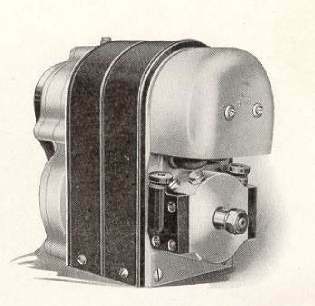 The Mag-Dynamo is designed to operate in connection with a 6-volt, 15 ampere hour battery or capacity suitable for varying loads, such as extra lights for side car. With the battery floating on the line, the unit has a maximum output of 3 amperes at 7.5 volts at 1400 r. p. m. of the motor, equal to 30 miles per hour, with the average road gear. One of the particularly advantageous features of the Mag- Dynamo system is that, should the battery become discharged or for any reason be unable to deliver current, the lights can be safely used with current direct from the generator, if a moderate speed is maintained. In order that the Indian electrical equipment may be complete in every sense, an ammeter of Splitdorf manufacture is included in the outfit. This high grade ampere indicator is a valuable addition to the Indian electrical equipment, for it is the very pulse of the whole lighting and ignition system. By the use of the ammeter the rider can detect at once any trouble in the system. Equipped with both a charging and discharging dial, it will instantly indicate any short circuit, failure of the battery to charge, or symptom of distress anywhere in the system. 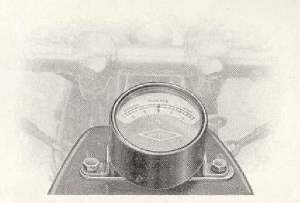 The ammeter is attractively designed, being placed on the forward portion of the gasoline tanks, always in sight of the rider. 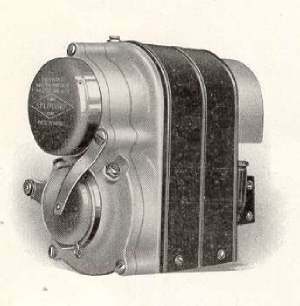 The Hendee Manufacturing Company has selected for their 1917 headlight and signal horn equipment the Old Sol "Hornlite" combination, manufactured by the Hawthorne Manufacturing Company. 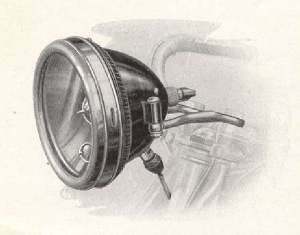 Besides the effective light projecting qualities of the "Hornlite" the combination of the headlight and horn in one outfit was recognized as a step forward in lamp and horn construction. The elimination of the horn and the substitution of the more attractive horn and light combination has already made a strong appeal to riders desiring a clean cut looking motorcycle, with as few accessories as possible. From a lighting point of view the "Hornlite" with its two-bulb headlight, especially built highly silvered reflector, its focusing device and its 21 candle power special Nitrogen bulbs, gives the utmost in lighting power. Concealed within the lamp is the warning signal which is operated by a hand switch located on the right hand side of the handle bar. The bell shape of the lamp acts as a sound-box, assisting the penetration of the signal sound. For compactness and trimness of appearance the "Hornlite" has no match. The rear light and registration plate holder combination, included in the 1917 Indian electrical equipment, is unusually sturdy and pleasingly designed. In designing the 1917 Indian Motocycle, provision was made to conceal the wires of the lighting and ignition system. The trimness of the 1917 Indian shows how admirably this has been done, for the unsightly draping of wires is almost entirely eliminated. This concealment of the wires means greater protection and longer wear. 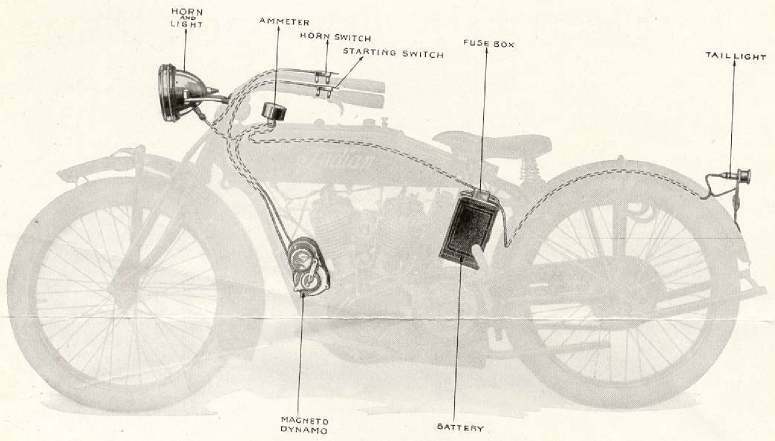 Altogether the 1917 Indian lighting and ignition system is the most complete, most efficient and compact of any ever offered by the Hendee Manufacturing Company - leaders in motorcycle design. Unquestionably the 1917 electrically equipped Indian is the ideal outfit . providing greater pleasure and more comfort - and gives its rider the satisfaction of owning the very best electrical equipment to be found anywhere. You of course will want an electrically equipped Indian! 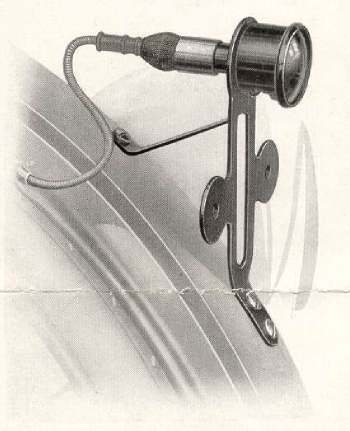 "HORNLITE" –COMBINATION HORN AND HEADLIGHT, WITH SWITCH AND DIMMER. TAIL LIGHT WITH REGISTRATION NUMBER PLATE HOLDER. FUSE BOX, STARTING SWITCH AND HORN SWITCH ATTACHED TO HANDLE BARS AND ALL NECESSARY WIRING.